Could Your Dentist Take 10 Years Off Your Appearance? When you think of anti-aging, you probably consider services offered by a plastic surgeon or esthetician. But did you know that your dentist can turn back the hands of time too? Today, more and more adults are turning to cosmetic dentistry to rejuvenate their smile and attain a more youthful facial appearance. In fact, one of the quickest and most affordable cosmetic dental procedures available may produce the most dramatic results in anti-aging – teeth whitening! Do you the color of your teeth reflect your age? If you see someone with yellowed, stained or dull teeth, do you assume they are older than they really are? This is a natural human response. It is why studies have found that those with whiter teeth are not only perceived as more attractive but also younger and more energetic. In one particular study, participants observed photos of a group of people before and after teeth whitening. In the after photos, age was perceived to be 10 years younger on average than in the before photos! Here’s the best news; changing the color or shade of your teeth isn’t difficult, and it is often not costly. 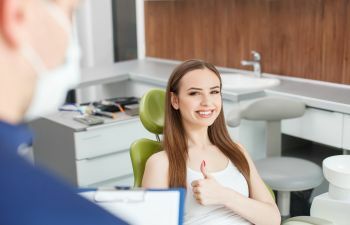 Professional teeth whitening has remained on the top of the list for the most sought-after cosmetic dental procedures for several years, which means patients are quickly catching on to the anti-aging powers of lightening your smile. Teeth whitening is also non-invasive and quite convenient. Many modern systems include the ability to lighten the teeth by several shades in a single hour! At Mitzi Morris, DMD, we proudly offer the most advanced and proven teeth whitening systems on the market. As an added bonus, we are a unique dental practice that also offers facial fillers and Botox. So, if you want to regain that youthful and vibrant look, we most certainly can help. In one single appointment, we can provide teeth whitening as well as facial injections for a wrinkle-free face and brighter smile! If teeth whitening fails to give the results you had hoped for, we also offer porcelain veneers as an instant way to transform your dingy smile into one you are proud to show off. Call Dr. Morris today to schedule your consult.